I was scuba diving in the Maldives. 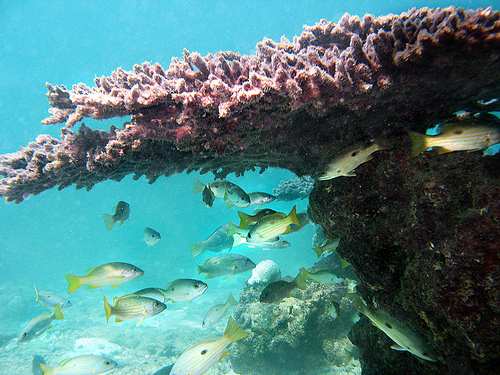 We finned down to look over a coral overhang to see if we could spot any sharks. Note that you don’t want to touch coral if you can help it, because you can easily kill it. However, there are a lot of currents in the Maldives, especially when the depth changes abruptly from shallow to deep. So – to avoid floating away – I swam to the edge and held gently on to a piece of coral with my thumb and fingertip. Trouble is, I held on to a surprisingly sharp bit, and cut my finger on it. Either that, or an unseen creature was living under the bit of coral I held, and it nipped me. So my finger was bleeding. The blood looked green because we were quite deep and the red spectrum of light is the first to disappear underwater. I was so interested that I kept squeezing my finger to watch the green droplets and pretend I was a Vulcan*. Happily, sharks are interested in fish blood not human blood, and there were none to be seen. I did the rest of the dive pinching the wound together, just in case. Because story-telling is a useful copywriting tool. Witness the rise and rise of celebrity gossip magazines. People can’t help but read human-interest stories. Almost every page on my new site starts with a story. You can do that too. For example, write case studies in in a story-telling format – start with the problem (what was the situation before you got involved), then describe the solution (what did you do) and end with the results you achieved (what changed as a result of your intervention). You can also tap into the story-telling trend to write compelling headlines.